To simply call this summer “busy” doesn’t quite explain it well enough. This was our first summer brewing and selling canned beer. We were told that cans sell better in the summer, which makes sense, since you can bring them to parks, beaches, and other places where you can’t bring bottles. And, that was the trend we observed – but the magnitude of the demand was much, much larger than we expected. And so, we buckled down and made beer. Lots of beer. Between 90-95 % of the beer we made was our annual (Hayburner, Low Bridge, and Excavator) or seasonal offerings (which for the summer, was FC, our our “fantastically crushable” summer session wheat IPA we brewed for FC Buffalo). That’s not to say we didn’t have anything new going on – this was the first time we canned FC, and we did release the second batch of Packet, our inaugural Lock IPA series beer, right before July 4th (to some pretty nice praise I might add). But, innovation certainly took a backseat to production this summer, without a doubt. In order to run a production brewery at full capacity, it takes a lot of concentration and saps a lot of creative energy; when the left side of your brain is working at 110%, there isn’t much room for the right side to do much of anything. Gin-Barrel Aged Beautiful River. When Bobby from Tommyrotter Distillery told us that the oak barrels he used for his award winning Cask Strength Bourbon-Barrel Gin were available for reuse, we jumped at the chance to fill them with beer. We had already been kicking around the idea of adding brettanomyces (“wild yeast”) to our Beautiful-River Belgian-style farmhouse ale; brett in saisons are not only historically accurate to some degree, but the brett helps to dry out the beer and provide wonderful complexity. So, we added a pitch of both Brett bruxellensis (which produces classic brett funk flavor) and Brett claussenii (which produces more fruity, pineapple aroma) and let that sit for several months. Finally, we decided to dry hop with both Galaxy and Motueka hops, to give the beer a bit of a tropical and citrus aroma pop. The result is incredibly complex; you get the brett in the aroma, with a touch of lime from the hops; the flavor is fairly gin forward, which lends some citrus and pine flavors, followed by a mellow oakiness. The beer is dry but not overcarbonated, allowing the flavors to cascade on the palate. I’ve tasted this beer four different times now and got something different every time I tasted it. The beer is 6.6% ABV and will sell for $14 per 16oz bottle, limit 2 bottles per person. Only about 200 bottles will be for sale. We'll be serving a limited amount of 1 oz pours at our tap room as well for $1. Tommyrotter will also help us create some nice craft beer cocktails to serve during the day as well (cocktail list still TBD). Meloneweizen. Most new beers we make at the brewery get differing opinions from our brewery staff – maybe a few love the new beer, a few think it’s solid, and maybe a few think the beer could warrant some improvement. This was not the case when we brewed a beer for a wedding we hosted at the tap room in July. The couple wanted something light and fruit forward, and our brewer Todd had suggested a Watermelon Hefeweizen that he had brewed in his past. The couple, guests, and all of our brewers loved it – enough that we decided to scale the recipe up and brew a production batch. No good beer is easy to brew, and this beer is no exception – it will contain over 1300 pounds of freshly juiced watermelons. The delicate clove and banana flavors from the yeast are complimented with a spritz of fresh melon flavor resulting in an extremely refreshing summer beer. It will be tapped around August 18th and on through the rest of the summer. Lock IPA Series #2 – Fip. 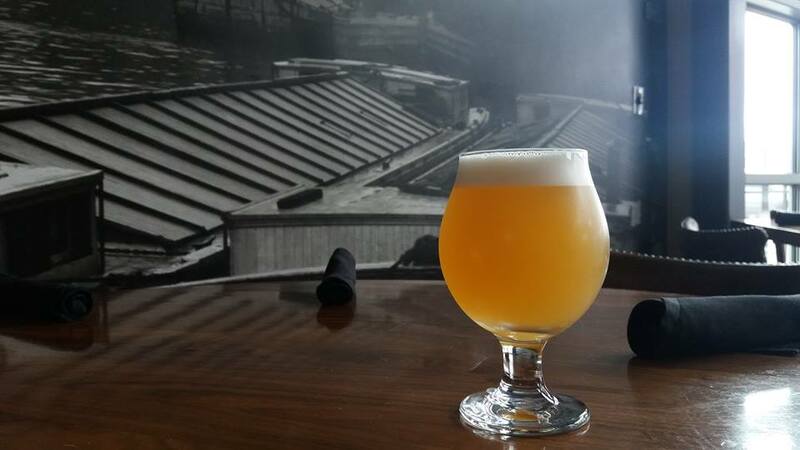 The second installment in our Lock IPA series Fip, is named after a coin worth about six cents that was used during the days of Canal construction. A fip was commonly used to purchase a glass of grog, or ale, after a hard days' work. Fip is brewed with Mosaic, Citra, Amarillo and Simcoe hops, resulting in an IPA with a burst of citrus, honeydew, and tropical punch flavor. It will come in at 6.8% ABV and cost $14 for a 4-pack of 16 oz cans. Expect to see this on sale at the brewery on or around August 26. Corey will show off the return of Jalapeno Cream Ale in the next few days, which features slight sweetness from the flaked corn used in the mash, and subtle heat and spicy tanginess in the finish from the use of jalapeño peppers in the fermenter! Devin will be bringing us an Elderberry Wheat Ale, which features fruitiness from the wheat and ale yeast and some tartness and mild bitterness from the elderberries added – an interesting summer beer indeed! Dave will be bringing us his Vermont-style IPA, which is brewed with Hallertau Blanc, Amarillo and Simcoe hops, for more orange and grapefruit hop flavor mixed with grape and passion fruit overtones. Could this be the next Lock IPA series beer? Stop down for a try when it’s around and let us know what you think. We’re excited to be serving some new beers for the first time in a while, and we hope you enjoy them. See you soon. In the last several years since our brewery opened, we’ve found that not every style matches our brewer’s interests with that of our customers. We enjoy beer from a variety of styles, but modern day beer drinkers seem to really want beers that are bold in flavor yet remain very approachable. This is a national trend for sure, but seems particularly true in Western New York. Which is probably why our IPAs are so popular. From the beginning, we vowed to make IPAs that defied the traditional incarnations of them; we shied away from making bitter, malty, and thick IPAs. Our first (and flagship) IPA was Hayburner, which is strong in flavor yet light bodied, and held a firm bitterness that was overshadowed by orange, grapefruit, and melon flavor. We like to say this beer is deceptively drinkable. And many others that have had the beer agreed. Following that beer was Deep Cut, our double IPA, which despite being stronger than Hayburner displays many of the same qualities, except the citrus hop flavor was now joined by notes of tropical fruit and wild berry flavor. But, these aren’t the only IPAs we’ve made. Over the last several months we’ve made a few pilot batches of some new ones that were equally good, only on a smaller scale. Well, it’s time more of you tried some of these. Introducing our Lock IPA series. Our Lock IPA series will be limited amounts of canned IPAs that explore the range of fantastic flavors found in hoppy beer. We expect to add a new addition to our Lock IPA series every few months. Usually, we’ll only make a batch or two of each of these beers a year. Expect the cans to sell mostly out of the brewery for a price of $14.99 per four pack of 16 oz cans with a one case limit. Some of these beers will also be on draft at our tap room, but in a much more limited amount than say Hayburner or Deep Cut. The first beer in this series is called Packet. Packet is named after the boats that transported early passengers on the Erie Canal. The beer is made with Galaxy, Mosaic, and Pacific Jade hops, resulting in a juicy, sticky hop bomb with tempered bitterness and tropical and lightly floral hop flavors abound. We are also getting a lot of fruit punch and pineapple out of this first batch. Not sure how much we’ll yield yet, but we’re hoping/expecting to get about 150 cases for the first run. Packet will go on sale on Saturday 4/22 at 11am. Similar to previous releases of Deep Cut, we’ll have free coffee for anyone who gets there early and decides to wait for some. We think you’re really going to dig this beer, Buffalo. Thanks in advance, and always, for the support. Cheers! We love pilsners. Not the American adjunct lagers you grew up on. Real pilsners. Czech, Bohemian, German, what ever you call them - we love them all. A well done pilsner is everything we like about beer: clean, drinkable, refreshing, yet featuring a nice, crisp hop and flavor with underlying malt complexity. The truth is, many years ago, Low Bridge was intended to be a pilsner the first time we brewed it in the winter of 2011. We (Corey and Matt) brewed the beer in my kitchen, split a 12 pack of Sam Seasonal, realized we didn’t have a wort chiller, set the kettle in the snow for two hours to chill, and went out for more beer. And also, tacos. The brew day took something like 12 hours. The beer wasn’t that bad – once the fermentation started. We pitched one pack of Danish lager yeast and started our fermentation at 45 degrees F. Nothing happened for the first 72 hours or so. We warmed it up to get it started then chilled it back down. It lagered for 6 weeks. It was pretty good actually, for the first try. Lagers are different than ales: they require more yeast, and more aging time (lagers are actually named from the German word "lagern", which means "to store"), and tend to be a little less forgiving than ales – that is, they need to have a very clean fermentation profile. For these reasons, the lager we brewed on that day became an ale by about version 5, a few years later. We thought we could still make a very clean and refreshing Golden Ale by controlling fermentation temperature and pitching a little more yeast. And we did, and it worked well. Low Bridge is quite lager like and has a lot of the nice qualities we like about pilsners – clean, refreshing, and flavorful. But, it isn’t a pilsner. And, so, we finally brewed one. The thing about brewing a lager is that to brew one means you need to have the capacity in your brewery to store one for a while. We couldn’t possibly make one for the first 2.5 years of operating our brewery because we were always behind in keeping up with the ales we make. So, we consider making this pilsner to be a big step in our brewery’s evolution - almost like we've finally grown up, so to speak. The other thing about brewing this lager, our pilsner, is that we think it’s pretty good. We originally brewed a pilot batch of the beer for our tap room first anniversary party. We celebrated our anniversary alongside Toutant and called the beer Toutant Pils. We liked it then. But temperature control is more difficult at small scale, and we thought it would be even better when we scaled it up. Just like you should have with a pilsner – the ingredients aren’t very complex. Simple malt bill, noble hops. Making this beer good is a lot more about the process. And the beer is good; having now brewed it at large scale, we can say that it’s very tasty. We’re calling the production batch - which we actually brewed as our 500th batch brewed since opening - Electric District Pils, which is a nod to our neighborhood, where the Electric Tower serves as a beacon for locating our brewery as well as several other new and wonderful restaurants. It’s 5.1% ABV, a German-style pilsner, with significant floral and spicy hop aroma and flavor, very mild bitterness, and nice, light, bready malt undertones. Come try some soon and celebrate our first lager with us. Cheers!